Please join us at 6:30 p.m. on Thursday 13th April at the Montgomery County Health and Human Services Building at 210 Pepper St., Christiansburg when Judge O’Hanlon from West Virginia will talk about producing queens and hardy survivor stock. Dan O’Hanlon has been a beekeeper & queen producer in West Virginia for many decades. He is an officer in his local bee club and the founder of the West Virginia Queen Producers, an organization dedicated to supporting local queen producers. Dan led the effort to pass the first bill in the nation granting beekeepers immunity from civil liability. 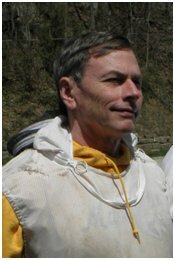 Dan was selected as the 2011 Beekeeper of the Year by the WV Beekeepers Association. We will have our monthly beekeeper raffle and a “what should you be doing with your hives this month” discussion. Please consider bringing a snack or drink to share.